A playoff battle of Top 10 ranked Class 5A girls’ soccer teams lived up to its billing as the No. 6 Starr’s Mill Panthers pulled out a 6-5 penalty kick victory over the No. 8 ranked Chamblee Lady Bulldogs at North DeKalb Stadium on Friday. Starr’s Mill’s goalie Jacqueline Rearden made a save with her team up 6-5 in the penalty kick shootout with Chamblee to give the Panthers the win. Mary Jane Gagliano had given the Panthers (14-4-3) the lead with her kick just before the big save by Reardon. The Bulldogs (15-3-2) had the opportunity to take the lead in the penalty kicks when goalie Skye Bragan dove to her right to make a block with the game tied at 3-3. Chamblee’s next try went high over the goal and Starr’s Mill would make its next three shots for the victory. Caiah Smith, Megan Woo, Savannah Lawrence, Molly Silverman and Teagan Furbish all made penalty kicks for the Bulldogs. Chamblee got off to a good start in the first half keeping the pressure on Starr’s Mill by attacking the goal with the ball. The strategy paid off with 12:51 left in the first half as Savannah Lawrence lofted a free kick deep towards the goal which was deflected to Furbish who powered it past the goalie for a 1-0 lead. 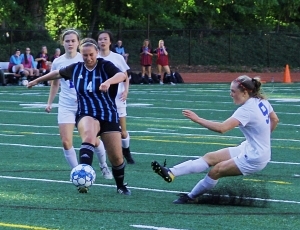 The lead would hold for almost 16 minutes when a Chamblee defender slipped to the ground while defending Stars Mill’s Sarah Evans. Evans got around the fallen Bulldog and was able to slide a shot just inside the left post past a diving Bragan to knot the game at 1-1 with 36:54 to play. Starr’s Mill had gone to the Chamblee playbook by attacking constantly early in the second half before Chamblee turned the tables in the final 22 minutes. One Chamblee shot just went high at that point and the Bulldogs continued to press on the Panthers’ defense. Ellie Furr got loose and had an apparent one on one with the Panthers’ goalie when a defender got just enough of the ball to allow the goalie to get in front of it for the save. Rearden made three more saves in the final 3:50 of the game to help send the game into overtime tied at 1-1. Journey Bradham came up big at the end of the second overtime for Chamblee. A Starr’s Mill player got a shot over the goaltender, but Bradham was in time to knock the ball sideways and out of bounds to send the game into the penalty kicks. The Tucker Tigers and Druid Hills Red Devils look to reach the Final Four in their respective classifications on Saturday. Druid Hills hosts Northwest Whitfield, a team they beat 2-1 in last year’s Class 4A Sweet 16 round, in a 2:00 pm contest at Hallford Stadium. Tucker heads to Chattahoochee for a 7:30 pm match with the No. 4 ranked Cougars as the Tigers try to reach their first ever Final Four.